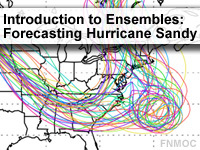 This module provides an introduction to ensemble forecast systems with an operational case study of Hurricane Sandy. The module concentrates on models from NCEP and FNMOC available to forecasters in the U.S. Navy, including NAEFS (North American Ensemble Forecast System), and NUOPC (National Unified Operational Prediction Capability). Probabilistic forecasts of winds and waves developed from these ensemble forecast systems are applied to a ship transit and coastal resource protection. Lessons integrated in the case study provide information on ensemble statistics, products, bias correction and verification. Additional lessons address multimodel ensembles, extreme events, and automated forecasting. The videos take a lot of time to load. Interesting with a case study! An interesting way of presenting the material within a story context. I am very surprise that the forecaster did not even consider or used the most accurate medium range forecast model and ensembles the ECMWF. Other than that it is a good module. Describe and compare the forecast products from each of the ensemble forecast systems above. Describe the products from both the North American Ensemble Forecast System (NAEFS) and National Unified Operational Prediction Capability (NUOPC). Explain how the MSC uses ensemble forecasts to automatically generate weather forecasts. Explain how NCEP ensemble forecast products are developed. Explain how ensemble forecast products from NCEP, NAEFS, and MSC are bias corrected. Explain how the UKMO uses ensemble products to create routing forecast products and tracks development of extreme weather events. Explain how the Navy and Air Force ensemble products can be used to create wind and sea forecasts and support optimum track ship routing. Describe the verification process and statistics for each ensemble forecast systems above, and compare their strengths and weaknesses.